18-19 October 1999 at the Greek Theatre, Los Angeles with LeMobile Recording Facilities. 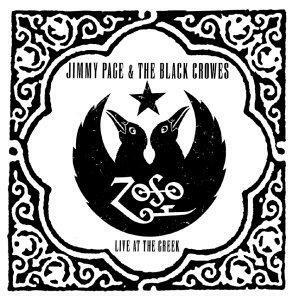 Live at the Greek is a double live album by Jimmy Page and the Black Crowes, released by musicmaker.com on 29 February 2000 and later by TVT Records on 4 July 2000. In October 1999, Page teamed up with the Black Crowes for a two-night performance of material from the Led Zeppelin catalogue and old blues and rock standards. The double-disc album, released originally only through the internet but then through retail on TVT Records, is a recorded snapshot of the entire concert from Page and the Crowes, one of the first before they set out on a full-length American tour in the summer of 2000. Recorded at the Greek Theatre, Los Angeles with LeMobile Recording Facilities, and mastered at Sterling Sound, New York. Due to contractual problems with their record company, The Black Crowes were unable to release any of their own songs which were played at the Greek shows. The band left American/Columbia in 1999, and they were not allowed to recut any song they released on the label in the years immediately following their departure. These songs, on which Jimmy Page played with the Crowes, included: 'Wiser Time', 'No Speak No Slave', 'Remedy', 'Hard to Handle', and 'She Talks to Angels'. The double CD was released in stores by TVT on 4 July 2000, and featured an enhanced Quicktime video and photographs taken during the concert. The Japanese version of the album also features 'Misty Mountain Hop' and 'In the Light', recorded in 2000. ↑ Critics Poll 2000. rocklistmusic.co.uk. Retrieved on 2009-10-19. ↑ Top 20 Albums of 2000. rocklistmusic.co.uk. Retrieved on 2009-10-19. ↑ 50 Greatest Live Albums Ever. Classic Rock. Retrieved on 2009-10-19. ↑ Top 100 Albums - 10 July 2000. charts-surfer.de. Retrieved on 2009-10-20. ↑ RPM Albums Chart - 17 July 2000. RPM. Retrieved on 2009-10-20. ↑ The Billboard 200 - 22 July 2000. Billboard. Retrieved on 2009-10-20. ↑ Top 200 Albums - 22 July 2000. lescharts.com. Retrieved on 2009-10-20. ↑ Top 40 Albums - 23 July 2000. finnishcharts.com. Retrieved on 2009-10-20. ↑ Top 100 Albums - 29 July 2000. chartstats.com. Retrieved on 2009-10-20. ↑ Top 100 Albums - 30 July 2000. swisscharts.com. Retrieved on 2009-10-20. ↑ Top 75 Albums - 6 August 2000. austriancharts.at. Retrieved on 2009-10-20. ↑ Top 100 Albums - 12 August 2000. dutchcharts.nl. Retrieved on 2009-10-20. ↑ Top 50 Albums - 27 August 2000. charts.org.nz. Retrieved on 2009-10-20. ↑ Top Independent Albums - 6 January 2001. Billboard. Retrieved on 2009-10-20. ↑ Top Internet Albums - 5 August 2000. Billbaord. Retrieved on 2009-10-20. ↑ Hot Mainstream Rock Tracks - 15 April 2000. Billboard. Retrieved on 2009-10-20. ↑ Hot Mainstream Rock Tracks - 2 September 2000. Billboard. Retrieved on 2009-10-20. ↑ RIAA.org Live at the Greek - 14 November 2000. RIAA. Retrieved on 2009-10-19. This page was last modified 07:01, 7 December 2013.